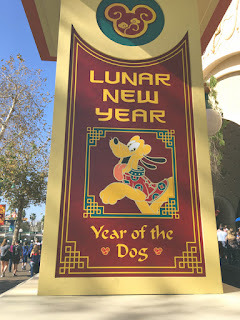 This is my first time celebrating the Lunar New Year and what better way to celebrate in style at Disney California Adventure Park. Lunar New Year, traditionally celebrated within Chinese, Korean and Vietnamese cultures, commemorates the moment when both the sun and the moon begin their journey for another year. 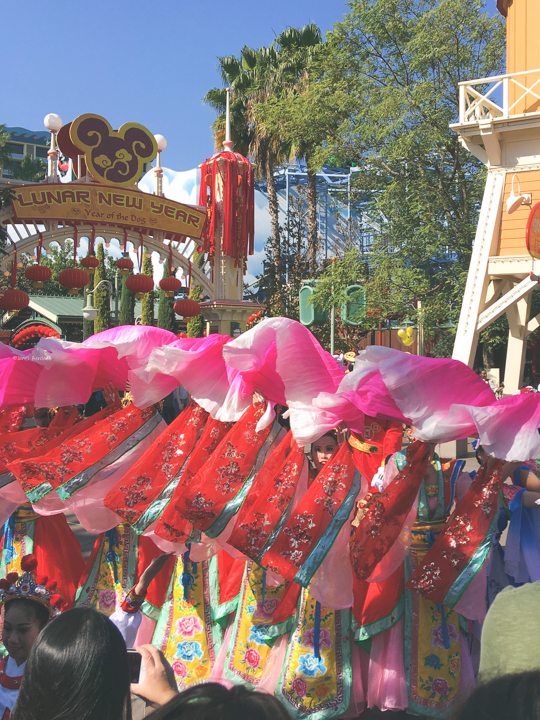 The 2018 Lunar New Year Celebration at Disney California Adventure runs for 24 days (January 26 - February 18, 2018). This event is full of multicultural performances, activities, festive food, beautiful colorful decor, character experiences and themed merchandise. 2018 is the “Year of the Dog” and ofcorse Pluto is there to welcome guests to the Lunar New Year Celebration. There are several multicultural performances and activities to experience. My favorites of the event were watching the “Mulan’s Lunar New Year Procession” and "Hurry Home" the show just before the evening World of Color. “Mulan’s Lunar New Year Procession” was a live performance of dancers in beautiful vibrant cultural costumes. “Hurry Home” consists of a moving musical score and spectacular lights accompanying a story of Mulan, Mushu, and a little lantern. There are several stations in the Lunar New Year Marketplace where you can purchase food from different cultures (Korea, China and Vietnam). Unfortunately most of this food is not gluten free so I didn't partake in it. 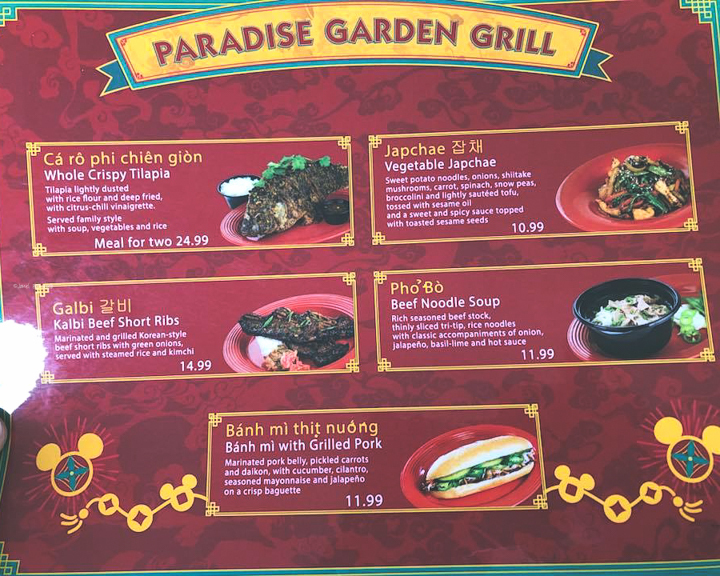 Over at the Paradise Garden grill there are several gluten free options of the Asian fusion fare. 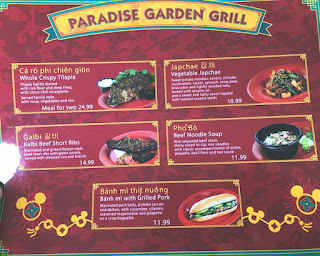 I did ask a cast member and was told the entire menu at the Paradise Garden Grill is gluten free except the Bánh mì thịt nướng (because of the bun). I have to admit I was kinda disappointed there were not that many options or even a easier accessible menu like at some of the other eateries in the park, but at least there were some options. I wasn't in the mood for Asian food so I did not try anything. There are several activities for you to participate in like making your own lantern, writing a wish for the Lucky wishing wall, face painting, meeting the characters and having an artist write your name in Chinese calligraphy. 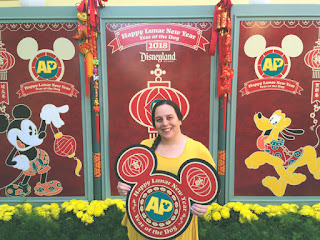 If you are a Disney Annual Passholder there is a special area next to the Paradise Garden Grill called the AP Corner. I was excited as a new Passholder to get the opportunity to participate. 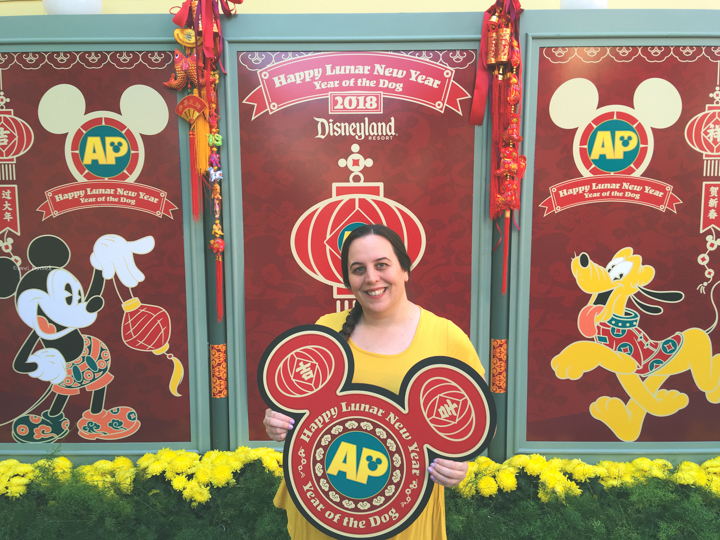 In the AP Corner this year you received a special AP button for the Lunar New Year (while supplies last). 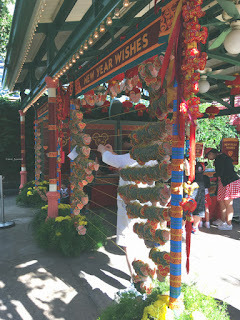 There was a Lucky Wishing Wall and special Photo opportunities with the photo pass cast member to take your photo. What I liked about the AP Corner is that it opened earlier and was in a quieter area of the park. After a long day of walking my family doesn't like to stay too far from Parks. On this trip we stayed at the Anaheim Hotel. 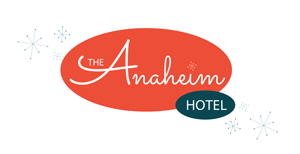 The Anaheim hotel is located on S. Harbor Blvd and is a 5 minute walk from the park main enterance. This hotel has been recently renovated and is affordable too. They offer a variety of discounts on room rates, even a discount for Disney Annual Passholders! We had a a wonderful stay and look forward to visiting again! Visit my Instagram for photos of the Anaheim Hotel Property. 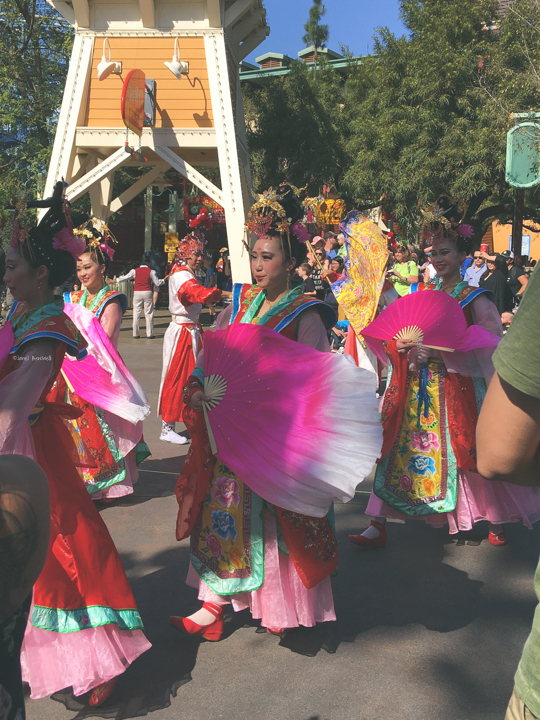 Overall, the 2018 Lunar New Year Celebration was fun to experience. There was so much to see and do, but it can certainly be accomplished in one day if you are limited on time. You certainly do not want to miss the special evening show of "Hurry Home" before the World of Color (I believe it is only at the 9pm show). It was the perfect way to end the day!